The authors found up to 8 Queleas each with one leg in a scorpion burrow, being held by a scorpion in a small area. The authors could not stay to see if the scorpions would exit their burrows to feed on the birds. Scorpions usually feed on invertebrate prey but also eat geckos, snakes, lizards and rodents. The scorpion Cheloctonus jonesii is a medium-sized, docile scorpion with very mild venom and endemic to the eastern region of South Africa. A large list of predators has been documented for the abundant Red-billed Quelea, including snakes, hornbills, raptors and mammals. This is the first record of quelea being attacked by scorpions. Abstract. Scorpions are reported for the first time predating on birds. In Kruger National Park, South Africa, we observed, in an area of approximately 20 m2, eight Cheloctonus jonesii Pocock, 1892. 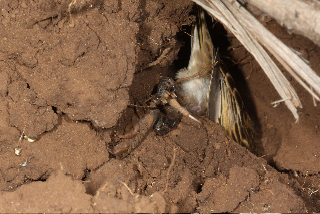 Each scorpion was in its burrow and had captured, by a leg, a juvenile red-billed quelea Quelea quelea (Linnaeus, 1758).